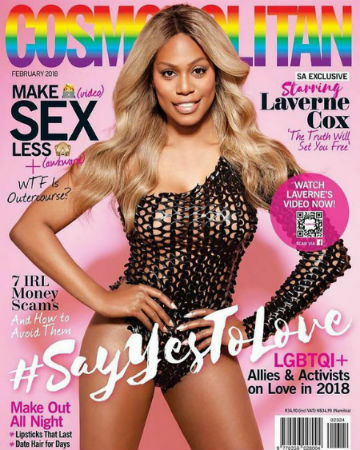 -Yay for Laverne Cox, who just became Cosmopolitan’s first openly trans cover model. -Today’s Oscar noms were a mixed bag. Though there’s still a lot of work to be done, but it was more diverse and not as #OscarsSoWhite as previous years, with four black actors included in the acting categories (Daniel Kaluuya, Denzel Washington, Mary J. Blige and Octavia Spencer), and Jordan Peele becoming only the third person to receive best picture, director, and writing noms. Women fared well too, with Mudbound’s Rachel Morrison becoming the first woman nominated for best cinematography in history, and Greta Gerwig becoming the fifth ever woman to be nominated for directing. And 8 of the 10 nominated actresses are over 40! -Meanwhile, the nominations seemed to solidify the sense that it’s now a two-way race between The Shape of Water and Three Billboards Outside Ebbing, Missouri. -I’m bummed there was no best pic noms for The Big Sick, The Florida Project or Wonder Woman, and no supporting love for Tiffany Haddish and Michael Stuhlbarg. I am not bummed at all by the James Franco snub. -I just took the Good Place soul mate quiz and got Tahini. That can’t be good. –Dylan Farrow’s clapback to Justin Timberlake makes me want to write poems in her honour. –Melissa Benoist’s outfit at the Waco premiere is so fugly, it’s nearly incomprehensible. Dear gawd, are those velvet shoes?! –Leonardo DiCaprio helped Orlando Bloom celebrate Bloom’s 41st birthday with a party full of models in Marrakesh. -I love that this reporter asked Sterling K Brown if he’d noticed how few black reporters were granted access at the SAGs (especially since there are rumours that Marvel is being selective on letting black journalists interview the cast of Black Panther). It’s opened up a wider conversation about access and revealed some not great stories about the Luke Cage media rollout. –Zoe Kazan has never been more relatable than in this pic of her meeting Frances McDormand. -It’s pilot season! Here’s a look at what the networks are ordering. (CBS has clearly took their criticism to heart; all of the shows they’ve ordered so far are from female creators). -One of the great byproducts of the Times Up movement in Hollywood is the growing transparency around pay. Over 100 anonymous TV workers shared what they make as pilot writers, on writing staffs, and as assistants. –Mo’Nique is blasting Netflix for not offering her what she deserves for a comedy special. (She’s not wrong.) Wanda Sykes offered her own story about being low-balled by Netflix. -The Honest Trailers treatment of Get Out is great.